Dragon Industries LaPorte Facility has a totally enclosed, environmentally controlled abrasive blasting and painting facility...one of the finest, if not the finest coatings/ blasting operations on the Gulf Coast. Our new 21,000 Square Foot totally enclosed facility meets all EPA Emission Control Standards. 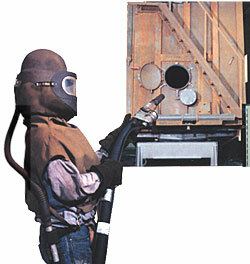 Dragon's Steel Grit Blasting Booth provides the proper preparation before entering the coatings booth. Jobs leave the booth clean and dry and are housed inside until coating. Dragon Products, Inc., P.O. Box 790, Beaumont, TX 77704. Tel: 409-833-2665; Fax: 409-833-3170.